Jose Caballero hopes to be the next AOC — in terms of Congress shockers. The 33-year-old Democratic political consultant says he will file papers Wednesday to challenge Rep. Susan Davis, a 10-term incumbent who has never faced a serious Democratic primary opponent. A Talmadge resident who ran a third-place District 7 race for the San Diego City Council in June 2016, Caballero says Davis, 75 in April, can be defeated from the progressive left. He hopes to borrow from the playbook that Alexandria Ocasio-Cortez used to upset 10-term incumbent Joe Crowley in New York’s 14th Congressional District in June 2018. Caballero thinks Davis has squandered chances in her “leadership district” — having such a wide voter-registration lead (about 20 points as of Feb. 28) that she never has to worry about losing to a Republican. 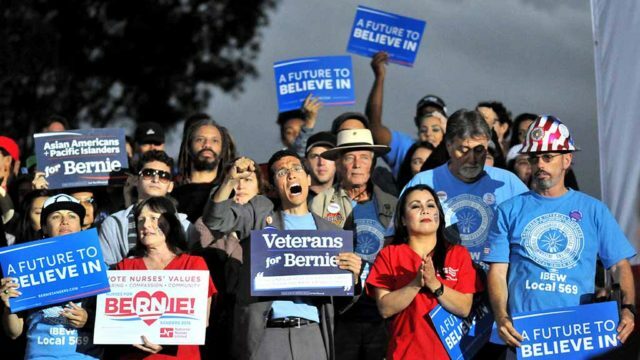 Caballero, a Bernie Sanders delegate to the 2016 Democratic National Convention, sides with the Vermont senator, and AOC, on the Green New Deal, healthcare-for-all, college “education-for-all,” student-debt forgiveness and a less-costly military. “For me, she’s the perfect foil for a candidate like myself that is not only going to be voting for these ideals but also fighting for them,” he said in a phone interview. So Caballero wants to go “toe-to-toe” with Davis in debates. “Her political consultants are going to say: ‘Just ignore it. He’s nobody,'” he said. How is Davis appealing to the Bernie/AOC/Justice Democrats cohort? 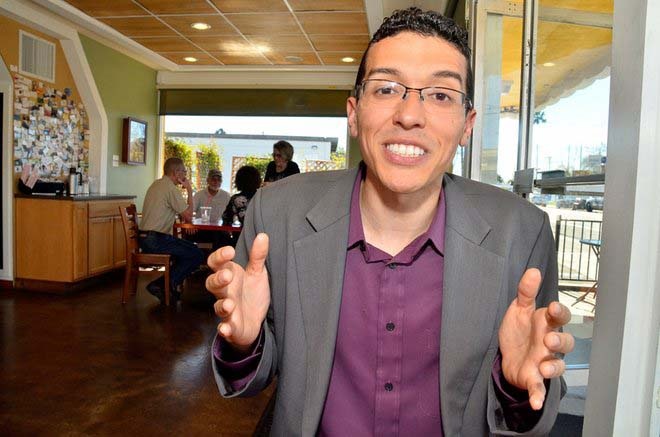 Caballero, a San Diego State University graduate, calls himself “a proud democratic socialist,” which he proffers as an ideology, not a party. He says examples of democratic socialism are fire and police departments, freeways, Social Security and Medicare. Caballero’s candidacy was no secret. In fact, the San Diego County Democratic Party website has listed him as a rival to Davis. He says he made a “soft announcement” a week ago Monday at the club he helped launch — San Diego Progressive Democratic Club. They met at Elijah’s restaurant in Clairemont Mesa. He made his race known to discourage other possible Democratic rivals. 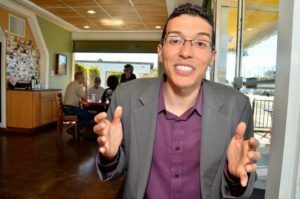 Caballero — who boasts being the only person who told council candidate Monica Montgomery from the beginning she was going to defeat incumbent Myrtle Cole in the District 4 race — spent about six months of 2017 and 2018 working in Connecticut for then 38-year-old governor candidate Dan Drew as fundraising director. Caballero says he’s taking the Justice Democrats pledge of refusing money from corporations and billionaires. He says he’ll build his campaign from individual donors, accepting labor union “organizational support” but looking for laborer donations. Caballero concedes that Ocasio-Cortez had a different path to Congress — holding more rallies in the geographically confined eastern Bronx and north-central Queens. “Overall, [my] message is pretty spot on,” agreeing with Ocasio-Cortez, he says. But he’ll try to raise more money early on to make a dent in the more suburban 53rd District, which sprawls from Allied Gardens to La Mesa and Lemon Grove through the heart of San Diego and down to parts of Chula Vista and Bonita. On Friday, Caballero hopes to meet his hero — Bernie Sanders — for the first time. The presidential candidate will be at an evening rally outside the County Administration Center. Caballero doesn’t expect an endorsement from Sanders, or AOC, just yet. First he hopes to gain the backing of Justice Democrats. A fellow traveler on the left is Doug Porter, the former San Diego Free Press columnist. He said Caballero is wise not to make age an issue since it can easily be turned against him. “He’s a young looking 33, and it would open up the door as to whether or not he’s experienced enough,” Porter said. The blogger (now at Words & Deeds) said elevating progressive agendas is the best strategy for him. But the odds are long for an AOC-style upset, Porter said. Carl Luna, the San Diego Mesa College professor and veteran local political observer, doubts a debate will take place. “She’s got a lock on the primary unless she fumbles the ball in a debate, so why take risk?” Luna said Tuesday. A bigger question is how spending might split the Democratic vote, he says. “Unless the Democratic turnout skews far more left than we’ve seen in San Diego in recent years, Caballero defeating Davis seems unlikely,” he said. Luna also likens the 53rd contest to East County’s 50th in 2018. In any case, Caballero has already swapped out logos on his old City Council Facebook page, and expects to launch his website soon. And drawing on his Navy veteran background, he plans to detail his “Hero’s Promise,” which he terms a service member Bill of Rights. Caballero, who says he first thought of running last fall, suggests a formal candidacy launch will be in April.